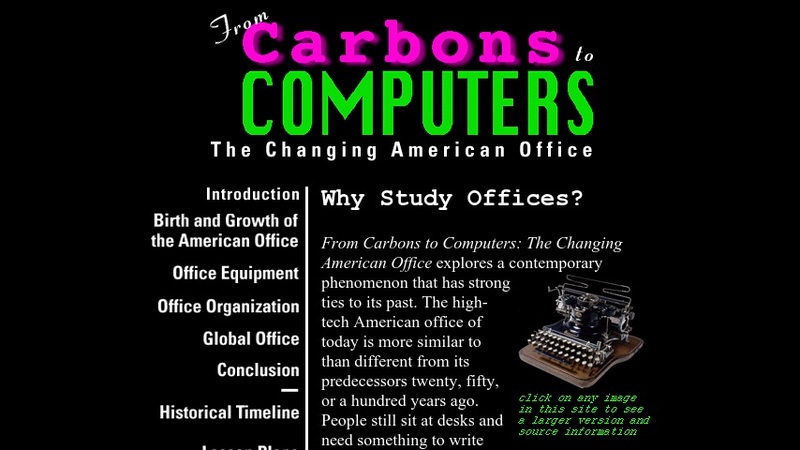 From Carbons to Computers: The Changing American Office is an educational website from the Smithsonian exploring the connections between contemporary and past offices. The website points out that the "high-tech American office of today is more similar to than different from its predecessors twenty, fifty, or a hundred years ago" and compares a floppy disk to a small-scale filing cabinet. The connections follow not only in terms of technologies, but in other more subtle ways as well, such as organization. The website offers lesson ideas for middle and high school students and provides background information on each topic. Visitors will find a history of the American office, a timeline highlighting several milestones, and a list of links to websites on various office equipment including telephones, typewriters and computers.